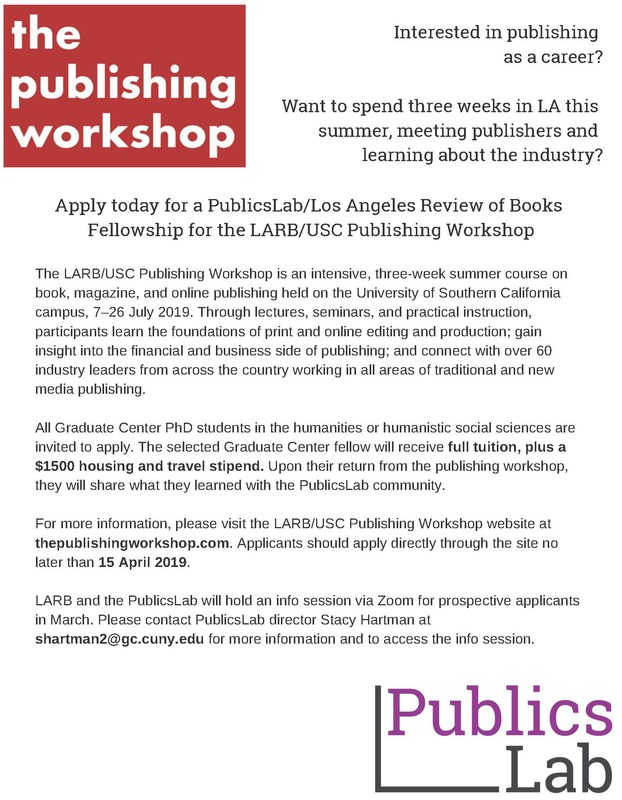 The PublicsLab is pleased to announce that in partnership with the LA Review of Books, we will be sending one PhD student from the Grad Center this summer to the LA Review of Books/USC Publishing Workshop. The LARB/USC Publishing Workshop is an intensive, three-week summer course on book, magazine, and online publishing held on the University of Southern California campus, 7–26 July 2019. Through lectures, seminars, and practical instruction, participants learn the foundations of print and online editing and production; gain insight into the financial and business side of publishing; and connect with over 60 industry leaders from across the country working in all areas of traditional and new media publishing. For too long, publishing has been inaccessible to all but a small segment of the population and the result has been a lack of diversity at every level of the profession. The LARB/USC Publishing Workshop aims to transform the industry from the ground up through its commitments to recruiting students underrepresented in the publishing industry; to prioritizing student financial aid; and to celebrating independent presses, outlets, and platforms throughout the country that are changing the face of publishing today. All Graduate Center PhD students in the humanities or humanistic social sciences are invited to apply. The selected Graduate Center fellow will receive full tuition, plus a $1500 housing and travel stipend. Upon their return from the publishing workshop, they will share what they learned with the PublicsLab community. LARB and the PublicsLab will hold an info session via Zoom for prospective applicants in March. Please contact Stacy Hartman shartman2@gc.cuny.edu for more information and to access the info session. Students can also visit the Publishing Workshop website for more information.